My apologies for this late March Favorites post but let's not further delay the wait and start already shall we?!? 1- Tangle Teezer Hairbrush: I learned this brush from Youtube beauty guru: Leighannsays and when I saw this at my one time visit to Sally's here in Brooklyn, I had to try it myself. I love this brush! Like it said on the box, you can use it on your wet or dry hair and I have done both and it works: It untangles my bed hair, my toweled dry hair and a very tangled hair from a windy day with no problems at all! I bought this for $12-13 at my Sally's and that was worth every penny! I don't style my hair a lot so I'm not sure if this is good to use when you blow dry your hair. It's probably awkward since it's not round, but just for everyday hair brush this is worth it! *Click on the name above to see a good picture of the brush. My picture will not do justice so a pro picture might be better. 2- Thayer's Witch Hazel with Aloe Vera Toner: I started using this to help with the my dry skin, small bumps and the redness around the nose. After just a few days in of using this morning and night after washing my face, I see my skin has improved! It's non-drying at all and is actually very hydrating to my sad, winter dry skin. 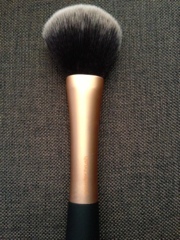 3- Real Techniques Powder Brush: I needed a nice fluffy brush for my mineral powder foundation and I read a lot of great reviews on this brand. This brush is so soft and gives a nice finish to my foundation application, which is what it claims. And now I can tell you this is true! It probably feels like your rubbing that cute chinchilla on your skin but this is actually made of synthetic taklon bristles! This is pretty up there as my fave drugstore brushes with Eco Tools. I am working on collecting all the brushes from Real Techniques since now I am intrigued on how their other face and eye brushes works. 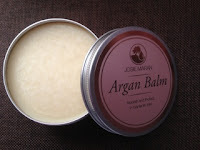 4- Josie Maran Argan Balm: I used this on my cuticles at night at first but I really didn't see a lot of improvement there, so I started using this on my lips, eyelashes, fly aways and dry ends of my hair. I put some on my lips before putting on lipstick and my lips stayed pretty hydrated for the day. No chapping at all which I usually get after having lipstick on all day. I put this on my lashes and around my eyes before going to bed, and I see my bottom lashes looks longer! This is a little pricey so I suggest to get it from QVC for great deals. I got this from buying their 5-piece Nourishing Package last February, which I will have a blog review post coming soon! I am in-love with this company that my next other favorite is from this brand again! 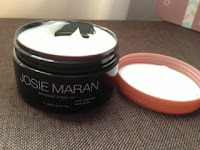 5- Josie Maran Whipped Argan Oil Body Butter: I use this all over after a nice shower and on my husbands feet, and now I am jealous how soft and smooth his feet feels after I give him a foot rub with this body butter! You only need a little bit from the tub since this melts into a non-greasy oil to your skin. It doesn't feel greasy at all as my skin just soaks all this lovely lotion in. If you have ashy elbows, dry hands and feet, try this body butter out. 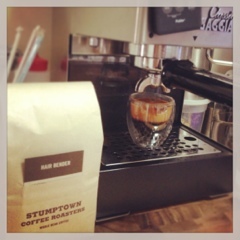 6- Stumptown Coffee Roaster - Hair Bender Blend: I've tried a lot of coffee beans to make my perfect espresso at home and I just had to add this to my list, and this is definitely on my top 2 espresso blend! It's just the right acidity, sweetness and body to it. Most espresso blends are dark roasted and very strong to my taste but this one is just perfect for a cup of cappuccino or latte or an affogato (espresso shot with a scoop of ice cream) for a nice dessert! Not a lot of makeup this month, a lot more in the skin care category. I am actually trying out a new foundation and I don't want to say anything about it yet since I just started using it last week. I am also still on the hunt for a great eye makeup palette, and trying to get myself to the Inglot Store in the city. So watch out for future blog posts on those, subscribe if you like so you don't miss it!